There are several pros of putting together a hot cocoa bar for your family on a chilly January Morning. 1.) You get hot cocoa. 2.) You get to see the loving surprised expressions on your loved ones’ faces. 3.) You get hot cocoa (Did I mention that? Because it’s important). There is only one con of a hot cocoa bar, and that is you are swimming in hot cocoa mix. Far more hot cocoa mix than the average family of 3 needs. So you get a little creative in how to get rid of it all, you know, beyond just drinking it all. Maisy is currently in a really fun stage of loving hands-on activities. 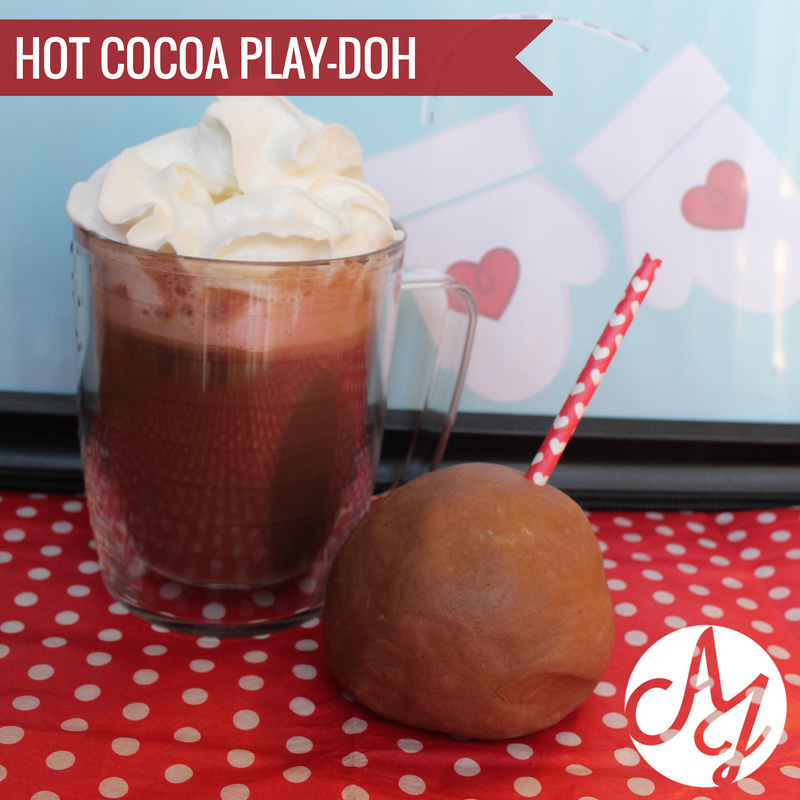 So I took some of the hot cocoa mix and added it to a recipe I typically use to make homemade Play-Doh. The result was a sweet smelling morning activity that Maisy really loved. I will say that the hot chocolate mix makes the dough a little sticky. You’re going to want to dust the play surface with a generous amount to make clean up easier. I always encourage Maisy not to eat the Play-Doh, but it is made with all natural ingredients from the kitchen so if your kids do get a little curious, you wont have to deal with Poison Control. This play clay smells sweet and chocolatey. Maisy had a blast using cookie cutters, a rolling pin and a few other kitchen utensils to mash it about. Mix together the dry ingredients. Melt the coconut oil so it’s in a liquid state. Add the melted oil and boiling water to the dry mix. Stir quickly to mix. When cool, mix with your hands. Dough stays fresh in the fridge for about 2 weeks. Hope you and your kiddos enjoy this fun activity! For more hot chocolate fun, visit Ally Jean on Pinterest.